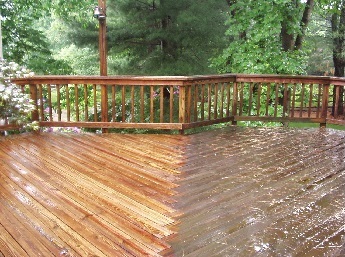 Roark Remodeling will power wash your deck/patio using a professional deck cleaner and rinse it clean. Power washing covers a 12'x16' deck including railing and spindles. This offer may be used on concrete patios. It does not include any outdoor furniture on the deck/patio. Maximum PSI of 2800 to be used to prevent damage to wood. Offer may be used on paver patios. Roark is not responsible for any damage or settling of paver stones as a result of the power washing. Other restrictions apply. If there are questions or more information, contact Roark at 740-777-1625. Does not include any outdoor furniture on deck. May be used for concrete patios. May be used on 16 linear feet of privacy fence (both sides) or 32 feet (one side). Price includes single story, one side of deck only. Two story decks or decks larger that 12'x16' will require additional vouchers. Not responsible for rotted wood damaged in the power washing process. May be used on paver patios but not responsible for damage or unsettling of paver stones. Deep stains from atmospheric algae, grills, etc may not be fully resolved without damaging wood. Roark will not damage wood to remove stains unless specifically specified in writing by homeowner. Power Washing may take up to 48 hours to dry prior to staining, depending upon weather. Deck staining services sold separately.